In April 2013, the National Organic Standards Board voted to not extend the approved use of antibiotics in organic orchards for fire blight control past October 21, 2014.Fire blight is the most devastating bacterial disease affecting apples and pears in the U.S. Fireblight is caused by the bacterial organism Erwina amylovora which grows readily and utilizes sugars and acids as food sources. An infected tree may die within a few months of infection. Fire blight was so named because the plants look as though they have been burned. Tissue infected with fire blight will exude droplets of sticky ooze that contain fresh inoculum. 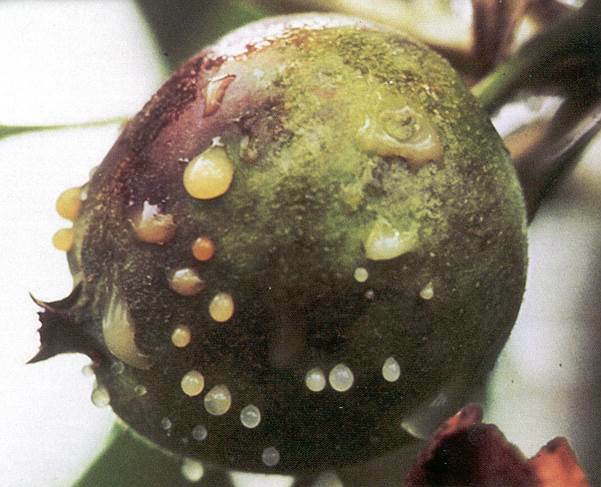 Infected fruit may exude copious amounts of bacterial ooze. Antibiotics have long been key disease control materials for fire blight control and both organic and non-organic growers have been permitted their use. However, after October 21, 2014, only the non-organic growers will be able to use them. “A bad fire blight year after 2014 could devastate some Northwest organic apple and pear growers, who have relied on oxytetracycline to control the disease, a researcher said. When the National Organic Standards Board voted April 11 not to extend the sunset for use of the antibiotic, orchardists faced the prospect of losing a useful tool without having a suitable replacement. Source: Capital Press. 4-26-2013, Pg. 7.